HUBERTUS-Solingen :: Hunter's Knife "Waidblatt" and Hunter's Knife Set "Waidbesteck"
Hunter's Knife "Waidblatt" and Hunter's Knife Set "Waidbesteck"
In the 16th century the hunter's knife set "Waidbesteck" used to be a set of hunting tools composed of an oversize gutting knife and different additional components such as a larding pin and a sharpening steel. As a tool to dismantle hunted game, the gutting knife was equipped with a heavy, broad blade and a short handle. It was also possible to use the gutting knife as a slashing knife to remove brushwood during game-stalking. When traditional hunting grew stronger in the 1930s the demand for an universal hunting tool arose again. It was developed in different design by three German hunt masters who patented their developments/inventions as "Waidblatt". Teamed with a "Nicker", a classic style German hunting knife ("Nicker") the Waidblatt is called Waidbesteck (Hunter's Knife Set). Both knives are paired in a heavy top grain green leather kangaroo sheath. 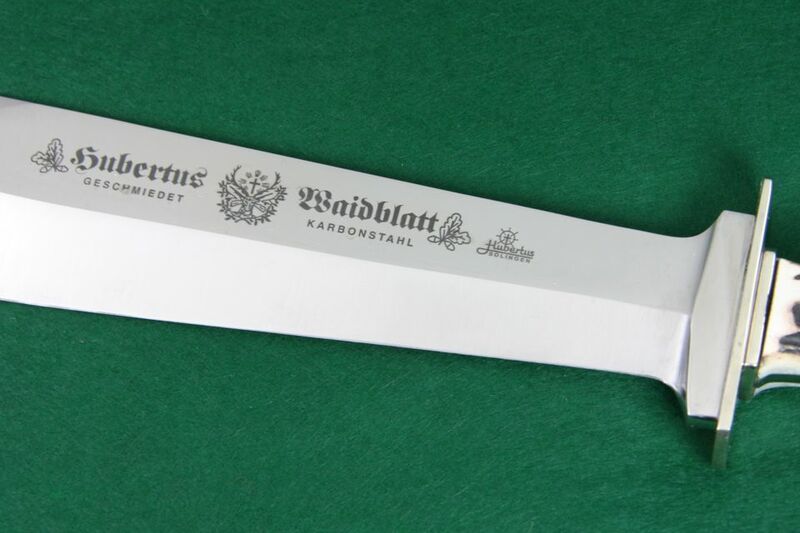 Our HUBERTUS hunter's knife Waidblatt was developed in cooperation with Carl Eickhorn cutler in the early 1950s. Carl Eickhorn was the leading manufacturer of edged weapons in Solingen that time. 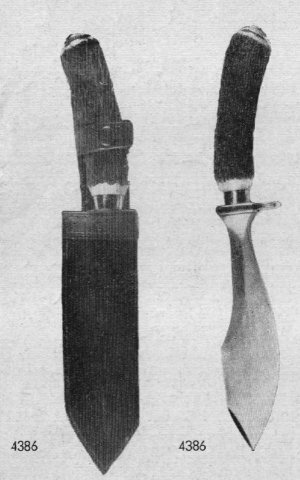 The Waidblatt and Waidbesteck were crafted both by Carl Eickhorn and HUBERTUS Kuno Ritter in partnership and marketed under both cutlers' brands. When Carl Eickhorn had to declare bankruptcy in the year 1976 the dies and toolings passed into the ownership of HUBERTUS. 22.202.HH.21 - Hunter's Knife "Waidblatt"
22.003.HH.00 - Hunter's Knife Set "Waidbesteck"
The Waidbbesteck set is teamed in a heavy top grain green leather kangaroo belt sheath.